3D Printing is here to stay. Manufacturers and enterprises across a broad spectrum of industries such as Aerospace, Automotive, Packaging, and Food are actively piloting and leveraging the inherent benefits of 3D printing technology. The worldwide 3D printing industry is expected to grow from $3.07B in revenue in 2013 to $12.8B by 2018, and top $21B in worldwide revenue by 2020. With the advent of 3D printing, there has been a tremendous breakthrough in today's food industry, with companies across the globe trying their hand at 3D printing food. Today, 3D printing is no longer an idea, but a reality that can revolutionize food innovation and production through better creativity, customizability, and sustainability. In the simplest of terms, 3D printing uses a process known as additive manufacturing, wherein 3D deposition printers slowly deposit layers of material, one of top of the other, until a product is created. 3D binding printers can also be used, where the layers are later bound with adhesive. The 3D printers used for manufacturing and creating food utilize lasers, powdery materials and nozzles, amongst others, and are opening up new doors when it comes to food customization and delivering a potent mix of just the right nutrients. While 3D Systems ChefJet uses crystallized fine-grain sugar for perfect geometric configurations and high-throughput confectionary, there are other companies who prefer using syringes to dispense chocolate into beautiful patterns. Yet another company - Foodini, is using edible ingredients squeezed out of stainless steel capsules to create a wide range of dishes from sweet to savory. A German nursing home, uses a 3D printer to create a food product called Smoothfoods, which is a concoction of mashed peas, carrot and broccoli. This tasty dish is then congealed with edible glue and served to elderly residents who face difficulties in chewing. This has been a huge hit, with over 1,000 such facilities in Germany adopting the technology. At the Consumer Electronics Show (CES) held in Las Vegas in 2014, the CIA Culinary Institute of America made a partnership with 3D Systems, the inventor of the ChefJet for beta testing their 3D food printers. The CIA plans on using 3D food printing in their internship and fellowship programs. The CIA feels that 3D printing is a boon where ideas can come to life and lot of time too can be saved in the process. There is really no limit to the scope and the future of the 3D printing industry. Very soon, you might be eating pastas, pizzas, brownies or quiche all printed from a 3D food printer! 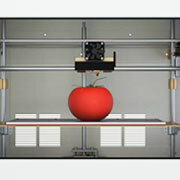 At present, 3D printers may not be producing great-tasting food or expertly cooking up elaborate meals from scratch. But they have the ability to do so and are getting better at their promise of better sustainability and nutrition. Anjan Contractor, an engineer, is working on the development of a pizza-making printer. He hopes his machine can produce food from capsules of oils and powders which have a shelf life of 30 years! Such a machine would not only minimize the environmental impact of cooking, but also present a renewable form of sustenance to a world where population is constantly growing. Lynette Kucsma, CMO and co-founder of Natural Machines feels that 3D printing can also ensure better nutrition. For instance, a printer like Foodini can not only minimize the amount of chemical additives but also minimize overconsumption. Very soon, people would be waking up in the morning and asking their printers to print a breakfast that has the right amount of fat and protein. At the same time, 3D printing, though advantageous, has to overcome several challenges, the main one being speed. Several of the common designs that food printers print today require the ingredients to be first cooled, before the application of the next layer, which leads to delay. Consumers as well, need time to get used to the idea of food printers, and not mix it with synthetic foods. The road ahead for 3D food printing faces several other challenges. It might take some time, but just like every other technology, 3D food printers are getting better every year. The promise of sustainable, affordable nutrition is worth our pursuit, and with the food industry looking at 3D printing to solve its problems, we should soon see it become as mainstream as a microwave oven. Outsource2india, a pioneer in providing outsourcing solutions offers cutting-edge 3D printing solutions to global companies. With our extensive experience in Rapid Prototyping and 3D printing services, we can meet your exact requirements and even develop print-ready STL files that can be immediately used for 3D printing. As our customer, you will not only save on cost, but can be assured of unbeatable quality and on-time delivery. Get in touch with us today for a winning 3D printing solution.